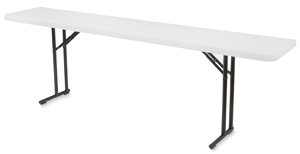 Just 18" deep and very lightweight, National Public Seating's Folding Seminar Tables are ideal for training sessions, classes, and demos in tight and/or temporary spaces. Made from high-quality, blow molded Dark Gray plastic, the tabletops are slightly textured for scratch resistance, yet smooth enough to write or draw on. The 16 gauge framing system features cantilevered legs that provide lots of legroom and spring-loaded, push button setup for ease of use and complete stability. National Public Seating's Folding Seminar Tables are MAS Certified Green.